The Blue Angels air show during Commissioning Week is one of the highlights of the year in Annapolis. The month of May brings warmer temperatures to the Chesapeake Bay area, making it perfect for sailing and enjoying the best of what Annapolis has to offer. In addition, one of the city’s most cherished traditions kicks off in the middle of the month. Commissioning Week at the United States Naval Academy brings with it a celebration of the Midshipmen and the history of the Academy. Also, the famed Blue Angels put on an air show over the city of Annapolis that draws a crowd from all over the area. What better way to celebrate a core Annapolis institution and see the Blue Angels than aboard the Annapolis sailboat charter Liberté? An Annapolis tradition, Commissioning Week is a week-long celebration of the Naval Academy that culminates with the graduation of the latest class of Midshipmen. This year, Commissioning Week begins on Friday, May 18 and continues until graduation ceremonies at Navy-Marine Corps Memorial Stadium on Friday, May 25. While some events are only available to Midshipmen and alumni of the Academy, there are plenty of events around the city also open to the public. One event that should not be missed is the Blue Angels air show. The Blue Angels, formed in 1946, are the Navy’s Flight Demonstration Squad, who perform for an estimated 11 million spectators across the country every year. In Annapolis, crowds gather on the banks of the Severn River on the Naval Academy’s campus to watch this amazing display of our nation’s most talented pilots. 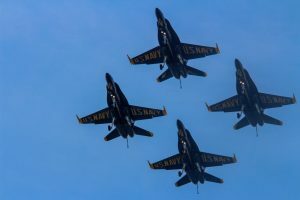 This year’s schedule includes flight rehearsal on Tuesday afternoon, a flight demonstration on Wednesday afternoon, and the time-honored flyover above Navy-Marine Corps Memorial Stadium during graduation ceremonies. This is easily one of the most popular events in Annapolis during the entire year, so by planning ahead, you can ensure that you have the best vantage point in the entire city – on the waters of the Chesapeake Bay aboard the Liberté! Enjoy the Blue Angels on the Waters of the Chesapeake with the Liberté! This entry was posted on Friday, April 13th, 2018 at 12:12 pm. Both comments and pings are currently closed.